Using an app he created, in classes he has configured around mobile technology, Ronald Yaros is preparing his students for a future that will revolve around their technological skills. "Today's students are tomorrow's information producers and consumers," said Yaros, who is an associate professor at the University of Maryland's Philip Merrill College of Journalism. "In the past five years, we have seen tectonic changes in how younger people adopt, adapt, and utilize mobile technology for virtually every aspect of their lives. For the next five years, I'm interested in how evolving technology will continue to change the ways in which users interact with information." According to Yaros, without a systemic change in how we engage students in and outside of class, technology can be — and often is — viewed as getting in the way of learning. "While we know that any device can distract from learning, we don't know how to change the ways a device can be used for sustained engagement and more effective learning. That's why we need a mindset shift to adapt a tool's use to class meetings, assignments and activities that require technology." Recently, Yaros explained in detail how his philosophy of teaching is not only engaging students in and out of the classroom, but also stimulating the learning process. CT: What classes do you teach? Yaros: I teach a general education course for 70 students from all majors, as well as a mobile journalism course for journalism majors. I also teach a Ph.D. research seminar certificate course for returning professionals wanting to expand their mobile skills. CT: Why do you teach a general education course? Yaros: A gen ed course provides me with a diverse student population from all majors and all interests. I don't want my research on user interaction with digital technology and information to be based on one field of study. CT: How do you conduct your classes? Yaros: I build my blended classes around technological assignments that focus on students' critical analyses, writing and thinking skills. My class meetings do not include PowerPoint slides in front of the room, or students sitting passively as they take notes for large written exams to come. I provide my students with "loaner" tablets. They can also use smartphones. There are instructors who believe that phone screens are too small for some content, but that's exactly how my students learn to produce, modify and share different types of content for those audiences using smaller screens. Yaros: I've found that using laptops in class is ineffective — especially with the option to look up for PowerPoint slides. This is because many of us have low digital self-regulation. That is, if the device is in my hand, I'll think of a way I can use it for personal reasons, not just for the task at hand. In addition, students are comfortable being in a state of what [writer and consultant] Linda Stone calls "continuous partial attention." When given the option to switch attention from a presentation to content on their screen, many will switch between the two. I started banning laptops a couple of years ago. I replaced them with tablets and smartphones — which display only one screen at a time — and an interactive app that I developed. Yes, students can drop out of the app — but they'll miss critical information for the next quiz, and they'll be clueless when I call on them to further explain the tweet or blog post displayed on everyone else's device. I'm finding that students are much more engaged with course content on tablets and smartphones. 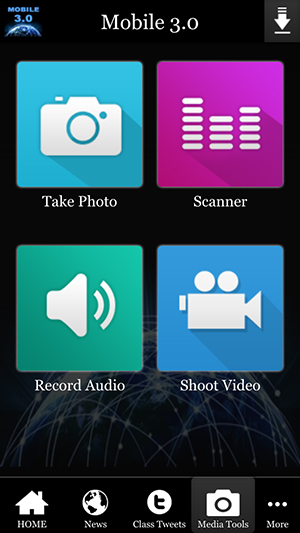 The Mobile 3.0 app has built-in tools for photos, audio and video. CT: What is the interactive app you developed for use in your classroom? Yaros: Mobile 3.0 is a free app available for Apple, Droid, Windows and Blackberry platforms. It includes multiple menus, choices and tasks — ranging from media tools to peer reviews and course blogs, which we call "e-portfolios." Each student produces and posts his or her own multimedia content related to the assignments. The Mobile 3.0 app has built-in tools for photos, audio and video, so that my students can learn how to produce high-quality multimedia. The app also adds the ability for me to push text notifications to all students without needing their phone number. CT: Why did you develop your own app? Yaros: I wanted to consolidate everything in my course into one "go-to" app. I require a sign-in screen, so that only my students can use the app. In addition, I can modify my app's menus at any time, so that dynamically changing content is pushed to students. Since the app synthesizes media tools with course-related material and assignments, everything can be done within one app. I no longer need to use (and support) multiple apps for multiple tasks. During our meetings, we use the app on our tablets or smartphones to share and discuss my content, plus the related content the students produced between classes (i.e., research, blog posts, visualizations and analyses of assigned readings). Mobile 3.0 now incorporates all of my slides and includes several built-in tools for interactivity, including instant polls, open-ended questions for students to discuss and answer, live Web sites, Twitter feeds, PDFs — even quizzes that report scores back to me. Since I no longer project slides in front of class, students must view the course-related content on their device if they are going to prepare for the next quiz or be asked to respond to an activity. It's amazing how much more engagement and discussion occurs without slides in front of the class, and laptops in front of every student. CT: How does the app function? Yaros: Mobile 3.0 typically has 10 to 15 menus, depending on the weekly assignment. I am now adding weekly mobile quizzes to the app; these are related to the readings that students are expected to complete. In short, my app allows students to complete all assignments whenever and wherever they want between face-to-face meetings. Most of the assignments require the production of content. In addition to using the Mobile 3.0 app between meetings, we use a free third-party app — Nearpod — during our face-to-face meetings, for dedicated screens and activities on the students' tablets and smartphones. We use Nearpod to share and discuss the course-related content that the students produced with the Mobile 3.0 app. Nearpod even provides a small area on the screen for students to add notes. Those notes are automatically e-mailed to each student after class. CT: How do your classes teach students to become better digital communicators? Yaros: From week one, they are repeatedly reading, researching, interpreting, writing, posting and discussing the content produced by me and by their peers. I scaffold these skills so that students constantly build on and improve their previously learned techniques for effectively communicating digital content on the Web and on mobile devices. The final project requires them to apply all of these new skills to produce and post multimedia reports related to a key question or issue in their major or field of interest. Many students say that the final project not only helped them to communicate better, but that they also learned a lot from the research they completed about their field of interest. CT: What about course content? 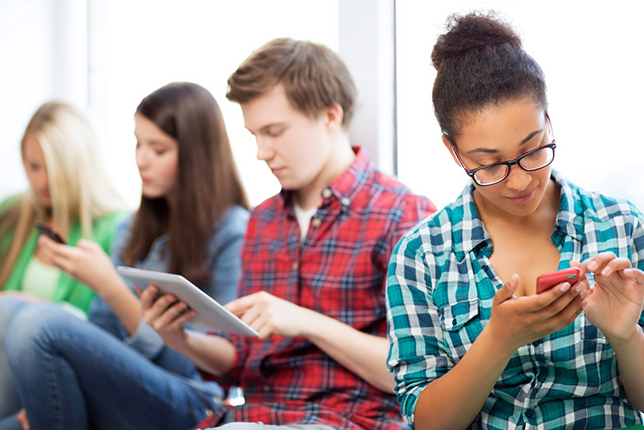 Why encourage students to stare at a device instead of paying attention to course material? Yaros: The empirical evidence shared and discussed as my students engage with — not stare at — devices consistently stimulates more critical thinking and richer class discussion in my courses than ever before. The important body of knowledge in my journalism classes still includes researching, analyzing, writing, sharing and discussing the countless behavioral, legal and ethical issues related to today's digital world, as published in top-tier journals in my field. Results from my assessments in the past five years show improved class attendance and participation, as well as richer textual analyses written by the students. Not all technology fits all classes, of course, but I believe there is something out there for every subject. The bottom line is not the technology itself but how the technology is used – and there are countless ways to use it. My research question is: what are the effects of newer technologies on the way we learn, work and play? My hope is that students leave my course with the professional skills they can apply in their field of work and not think Twitter or Blogger is useful only in social circles. My goal — to contribute to our growing body of knowledge about learning — continues to be a work in progress in our rapidly changing digital world.